There is more than one band called Elixir. -A British heavy metal band -A UK trip-hop group - An alternative rock / modern rock band from Canada. Pre-Versus the Nothing -An Australian jazz trio featuring Katie Noonan, side project of the pop/rock group George -An Indian metal band -A dance band -An illbient project by GrandMixer DXT 1) Elixir is a British heavy metal band, formed by Steve Bentley, Kevin Dobbs, Nigel Dobbs and Phil Denton in November 1983. They are notable for being associated with the New Wave of British Heavy Metal movement. 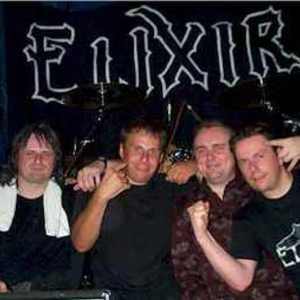 1) Elixir is a British heavy metal band, formed by Steve Bentley, Kevin Dobbs, Nigel Dobbs and Phil Denton in November 1983. They are notable for being associated with the New Wave of British Heavy Metal movement. The band spent the first time after having formed writing material and rehearsing. After brief stints as "Purgatory" and "Hellfire" the members finally decided on naming the band "Elixir". In need of a vocalist Elixir recruited singer Sally Pike, but after recording a four song demo tape and playing two gigs together, she left the band by the end of the year. In 1984 Pike was replaced by Paul Taylor, and later the same year guitarist Norman Gordon joined the band to fill the vacant spot left by Steve Bentley, who departured after Elixir had completed their second demo tape. Two years later, the band recorded their first album The Son of Odin. In issue 137 (Nov 2005) of Terrorizer magazine, the album was included in the top 20 power metal albums of all time. Elixir recorded their second album Sovereign Remedy in 1988 with Mark White on the bass and former Iron Maiden drummer Clive Burr. Stevie Hughes replaced Burr for the band's live commitments through 1989. At the end of the year, Phil Denton quit the band and was replaced by Leon Lawson for several live shows before the band came off the road. In 2001 the band reverted back to the Paul Taylor, Phil Denton, Norman Gordon, Kevin Dobbs and Nigel Dobbs line up and recorded their third album The Idol. 2) Elixir is a trio from the UK whose music can best be described as a combination of dark hip-hop beats, obscure samples, and live instrumentation on guitar and bass. The group has released three full-length albums: The Phobos Incident (1997), Music Mathematics Magic (2000), and Don't Be Scared (2003). 3) Founded by Katie Noonan in 1997, Australian jazz trio Elixir released their debut self titled album in 2003. The trio also features Nick Stewart (from band George) and saxophonist Isaac Hurren. Playing dreamy jazz-folk, the band has covered songs by the likes of Elton John, Nick Drake and Ani Di Franco. Elixir is currently in the writing process for a second album planned for release in April 2011. 4) Elixir from India a band that was based in Delhi. Had Chetan (Guitars/Vocals), Kabir (Lead Guitars), Yuvraj (Drums) and Shamul (Bass). They played mainly thrash metal influenced by bands like Megadeth, Metallica. They disbanded a few years ago. 5) Elixir is a high energy dance band and caller combination. Elixir draws on a wide range of styles and evoking a variety of moods, combining elegant melodies, raucous dixieland horn riffs, transcendent harmonies, playful improvisations, and rock, swing and reggae-inspired rhythms that weave in and out of traditional and original Irish, French Canadian and New England tunes. Their repertoire that includes music for contra, square, English and swing dancing; waltzing; couples dancing; and concert programs. 6) Elixir, illbient / turntablism project by GrandMixer DXT aka DXT, released the album Hegalien Zone on Ion Records in 1997. The album also features Bill Laswell on bass, Umar Bin Hassan on vocals, Jean-Pierre Sluys on sampler, and Sassan on flute.